In September 2012 it was reported that the death rate was rising, and life expectancy falling, for middle-aged White women who had not completed high school. In March 2015 a subsequent study showed that life expectancy was falling for middle-aged White women in general, as I discussed here. Now a new study has found a surge in mortality, and thus a decrease in life expectancy, for all White people age 45 to 54. All of these studies have been greeted with shock and disbelief, but they are no surprise to me. I predicted this years ago. This is just the tip of the iceberg, and sooner or later people will have to face the fact that what is happening isn’t about gender, or education, or race, or middle age. Those age 45 to 54 today are the first generation of Americans to be worse off economically than prior generations had been at the same age. The generation that was in childhood when the divorce and single parenthood wave hit, and thus the first to be affected by it. The first of a series of generations that have been disadvantaged in public policy. The first of the generations to follow in the wake of Generation Greed. Let’s start with the latest paper, which can be read in full here. What is happening has already caused almost as many extra deaths as AIDS, and yet no one had noticed. Let’s just say people are not anxious to hear the news. The paper was rejected by two prestigious journals, even though one of the authors has recently won a Nobel Prize. The New England Journal of Medicine gave this reason for rejection. So I’ll give you some reasons later in the post, but first let’s consider the causes of the rising death rate for Whites age 45 to 54. Suicide. Poisoning, including alcohol and drug overdoses. And liver diseases and cirrhosis of the liver, associated with alcoholism. But how different are these things? Suicide – I’m going to take enough of this stuff so it kills me. The others? I’m going to take a bunch of this stuff and who cares if it kills me or not, all things considered? But let’s check the numbers on suicide. Not because suicide is that important in and of itself, as most people don’t kill themselves, but because it is an indicator of other things. How people feel about life. Their health and psychological well-being. Their economic circumstances. Other factors affect suicides – the consequences of war, surges and reductions in substance abuse, and anti-suicide efforts. Still, however, one can infer from an increase in suicide that many more people than those that kill themselves have become worse off. And from decreases in suicide that many more people have become better off. Now it generally isn’t my style to use secondary sources, but I was able to go to primary sources and confirm that it was the same data for 1990, 2000 and 2010. And 1980 was close to what I was able to get for 1979 and 1981. So on that basis, I’ll trust Pearson Education, Inc. got the right numbers for 1950, 1960 and 1970. Here is the Infoplease table. With a link to their spreadsheet. And here is the same data reorganized not by year, but by different generations (based on birth years) who were different ages in different years. With a link to that spreadsheet. This data is for all Americans, not non-Hispanic White Americans, as in the paper. According to the paper Black Americans still have a higher death rate than White Americans, but their trend is positive. Perhaps because things have been tough for Black Americans all along, and they aren’t facing a drastic decline in their well being. Perhaps that’s why President Barack Obama didn’t understand until it was too late that what started in 2008 was not just another recession, but the end of an economic epoch. His yuppie economists, starting with Larry Summers, didn’t get it either. Meanwhile, U.S. Hispanics have a higher life expectancy than Whites, and it continues to improve. What does the suicide data for all Americans put together show? It shows that rising suicide rates for the generations of Americans born after World War II go back a long way, not just to 1999 as revealed in the recent paper. Those who were at ages 45 to 54 in 2010, and having a big jump in the suicide rate at that age compared with the generation immediately preceding at that age, also had a big jump in their suicide rate at ages 15 to 24, compared with the generation before. This is the back half of the Baby Boom, the Stagflation Generation that entered the labor force after the median earnings of Americans peaked in 1973. Back then the jump in suicide was discussed as a consequence of the problems of youth. And now it is being discussed as a consequence of the problems of late middle age. But that isn’t it at all. 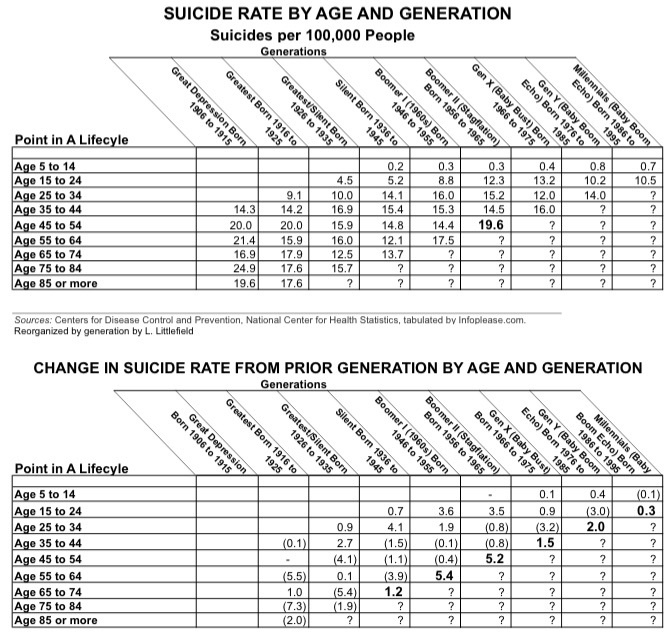 It is worth noting that the 1960s generation, the first half of the Baby Boom, also had a big jump in suicide, relative to the generation before, at ages 15 to 24, ages 25 to 34, and, over the decade from 2000 to 2010, from age 55 to 64, as well. In between, however, that generation had joined the falling suicide trend. The 1960s generation, the second half of Generation Greed in my phraseology, has been better off economically than the generations to follow. But in younger days many of its members did have the Vietnam War and a massive drug abuse wave to contend with, and that might have led to more suicide back then. As for the increase in suicide at for the 1960s generation at ages 55 to 64, I had expected that generation to be better off than those after it in old age, given an earlier Social Security retirement age than those to follow and pensions that subsequent generations did not get. But the 1960s generation still might be worse off on average in old age than the generation before it. In ten years, I’d expect the back end of the Baby Boom to have an even higher suicide rate – and death rate – at age 55 to 64 than the 1960s generation. Meanwhile those over 65 in 2010 have been insulated from trends that in many cases they created, and have a lower suicide rate. The Federal Reserve showed that adjusted for their higher educational attainment, the first half of the Baby Boom has been less well off economically (in terms of average earnings) than prior generations at each point in their lifecycle. Since it was better educated, however, that generation was still better off in an absolute sense than the so-called “Silent Generation” that spent its teens in the 1950s and early 1960s. The generations after that, however, staring with the second half of the Baby Boom, have been worse off in absolute terms, as I discussed here. Though these younger generations have been in reality much poorer, they didn’t live that way for much of their lives. Falling inflation-adjusted earnings were covered up first by more family members working, which allowed the income and consumer spending of households as a whole to continue to rise. Then by lost future income in retirement, as defined benefit pensions were taken away and the employer contributions to defined contribution (actually undefined contribution) plans were cut or eliminated, recession-by-recession. Americans born after 1957 should have drastically reduced their spending and increased their savings to make up for this (my household did), but most saved little and kept spending instead. Consumer demand in the U.S. economy would have collapsed then, instead of now, if they had acted to secure their old age. The final adaptation was soaring consumer debt, right up to the collapse in 2008. Soaring debt, and the advantages of youth, covered up how much worse off those generations born after the mid-1950s are, until it could not be covered up anymore. Now those generations born after 1957 or so – all of them – are facing old age with little in savings and often with debts instead. Merely not better off? Aside from information technology and perhaps health care, which is why the death rate isn’t even higher, things are much worse than that. Piling on, the generations born after 1957 have been disadvantaged in public policy, compared with those that went before, often increasingly so generation-by-generation. As a result of policies pursued by the preceding generations in their own interest, with revenues advanced to the present (now the past) and costs shifted to the future (now the present). These poorer generations are thus inheriting huge public debts, unfunded retirement obligations, and a diminished infrastructure. Already they are facing a full Social Security age of 67 rather than 65, even though their health is worse on average than those that went before, and despite this Social Security is an estimated 25 percent underfunded. Thus for a few decades the disadvantages of generations born later were covered up by the advantages of youth. But then my generation hit age 45 to 54, and suddenly everyone is shocked at a rising death rate and falling life expectancy. The disadvantages will accumulate at older ages, as several generations face a drastically lower standard of living, ill health, higher taxes, diminished government benefits and collapsing public services. So what will the increase in the death rate look like a decade from now? Two decades from now? What will happen to the life expectancy of those ages 45 to 55 in 2010 when they reach age 55 to 64, and age 65 or more? Monday’s bleak findings could have far-reaching implications as the surviving members of this sizable segment of the population continue toward retirement and eligibility for Medicare, according to experts. A sicker population that has been less able to prepare for the costs associated with old age will place an increasing burden on society and federal programs, they said. Or be less costly, because they are just left to suffer and die before becoming eligible for the program. I’ve often told my peers that they shouldn’t expect much from Social Security and Medicare; medical marijuana followed by legal assisted suicide is more like it. The only good news is that apparently you don’t have to wait for age 67, or age 72 or whatever it will be, to qualify for suicide. Moreover what will happen to the life expectancy of the generations that were younger than age 45 in 2010, in some ways even more disadvantaged, when they reach late middle age and old age themselves? Adding to the disadvantage of later-born generations was the collapse of families that got rolling in the 1970s. This, and mobility around the United States, have left many people socially isolated as they face a more difficult time in their lives. A lower level of social isolation, and the fact that they were never that well off to begin with, may be what is allowing the perceived well being of Hispanic Americans to remain high and their life expectancy to continue to increase. Even though they are poorer than White Americans. After all, the White Americans now dying in larger numbers in late middle age are not terribly poor by global and historical standards. They are just poorer than the generations that preceded them and, because they didn’t live that way for much of their lives, drastically poorer than the used to be, as I noted here. It is this reality, and this experience, that is leading to a social and psychological collapse. One can only hope that my children’s generation, like Afro-Americans, will understand that they are screwed and thus not upsize their lifestyle and then be forced to downsize it later, like several generations before them. Because I wouldn’t expect higher educational attainment to insulate people from a falling standard of living in the long run, because of the way falling inflation-adjusted earnings worked its way up the socio-economic ladder. The first to see their income fall, in the 1970s, were high school dropouts, which is why the public policy response emphasized getting every child a high school diploma at the time. Then the average earnings of high school graduates began to fall, starting with the “de-industrialization” recession of the early 1980s. The 1980s were the heyday of the yuppies, and the “solution” to falling income, it was thought at the time, was for everyone to go to college. But the average earnings of college graduates started falling in the early 1990s recession, the first in which this advantaged group faced large-scale long-term unemployment. Only those with graduate degrees got ahead in that decade. But only the so-called one-percent got ahead in the 2000s, but after 2008 even they saw their income fall, leaving only the 0.1 percent getting ahead. And soon not even them. That’s the outcome of an economy where total debt (public and private) soared from 167 percent of GDP in 1980 to 348 percent of GDP in 2009. And the only idea anyone has for avoiding an economic abyss is getting it rising again. Here in New York City, where the most hopeful and dynamic young people from more devastated areas of the country keep pouring in and yet another stock market bubble has temporarily improved state and local government finances, I get the feeling that no one really understands what is going on in most of the country. Particularly no one among the better off, the yuppie set. They are insulated, but shouldn’t be insensitive, because the reality of a vastly diminished future is not far away, in space and perhaps in time. Today we only see the products of broken families and falling incomes when they show up here, as more and more are starting to, from places like the Midwest and South. The places where the rising White death rate is probably most prevalent. How long have I been aware of increasing disadvantage by generation? A few decades. All one had to do is pay attention to social statistics and read the news without forgetting it. Which is why I have always found the continuous grasping for advantage by the already privileged so abhorrent. And the continuous upsizing of what people are told a middle class life is, to a level I knew they couldn’t afford, so abhorrent as well. Consider that I said when I ran against the local state legislator hack back in 2004. At one time, the U.S. was not very good to its senior citizens. 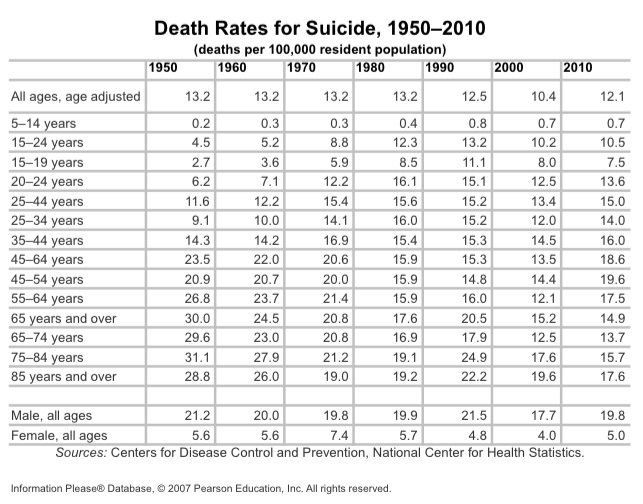 In 1950, the suicide rate for people age 65 to 74 was 29.3 per 100,000, while for those age 15 to 24 it was just 4.5. In 1969, the percent of persons age 65 and over in poverty was 25.3 percent, compared with just 13.8 percent for those under age 18. In the 1950s and 1960s, before Medicare and the creation of other senior benefits, everything was for the children and the young, while the old, who had worked and sacrificed, were neglected and forgotten. Today things are just as inequitable, but in the opposite direction. Rising federal, state and local debts will burden future generations, but few major infrastructure improvements are built. Multi-tier labor contracts provide enriched compensation for those with seniority, but diminished benefits more recent employees. The suicide rate for persons age 65 to 74 fell by half to 15.0 per 100,000 by 1996, while that of those age 15 to 24 nearly tripled to 12.0. In 2002 only 10.4 percent of Americans age 65 and over were poor, compared with 16.3 percent of those under age 18. Today’s elderly are not, on average, the most needy anymore. New legislation introduced by Sen. Elizabeth Warren and 17 others would give Social Security recipients the same raise chief executives saw last year. The populist measure, which has little chance of passage, would give Social Security recipients a 3.9% increase, which is the same gain as the average CEO compensation rise for the top 350 firms. Senator Bernie Sanders is on board, and why not? The last time there was no Social Security inflation increase, because the inflation rate was zero, in 2009 he was quoted as saying it was “outrageous” that “seniors on fixed incomes” wouldn’t get the kind of increase in their income that they had relied on over the years. No matter that the income of working-age adults was plunging at the time. So the richest Americans, who sit on each other’s boards and vote each other a higher and higher share of private sector wealth, have decided they deserve at 3.9% raise in a year of zero inflation. And the people age 65 and over in Congress, the richest generations in American history and generations far better off than those who were born after, demand the same deal for their crowd. Perhaps the states could also increase the pension benefits for already-retired public employees who stopped working in their mid-50s by 3.9%, and make it a trifecta. How to pay for it all? Borrow the money, and promise to pay it back but cutting senior benefits and pensions for less well of younger generations, and they could probably get Paul Ryan and the Tea Party as co-sponsors. Because they have “time to adjust.” Perhaps by committing suicide or drinking themselves to death. The entitled keep taking more and more. And they don’t want to hear about the consequences for others. Not from their politicians. And not from the media. The shocking news that for generations born after 1957 or so life expectancy is falling is already fading from public discussion, replaced by the clown show that is the national Presidential campaign. Even though it is more consequential that anything else that has been reported for years. In fact, perhaps the Donald Trump campaign is just a symptom of the consequences of this long-term trend, with a shrewd and cynical man taking advantage of, in effect, mass depression. How would The Donald, of all people, be in touch with what ordinary Americans are feeling and experiencing when others among the elites are not? Well he was in the casinos business, one casinos are one of the last stops on the economic despair tour. He was in that business before all of his customers went broke and got foreclosed, and so did his casinos. This paper, widely reported over a few days last week, is already in the process of being forgotten. But there will be other studies, because this is going to get worse and worse. Vital statistics, such as birth and death, are the ultimate statistics. They are the most venerable, the easiest to measure, and the least subject to interpretation. Since they correlate with health, and (health aside) individual happiness may be more a result of personal circumstances than social arrangements, one could argue that vital statistics are the best measures of social well being. Everything else – education, income, poverty, household type, housing – could be considered as a mere cause or explanation of what really matters in the end. A 30 year trend in the wake of Generation Greed is now showing up as deaths, and it will become harder and harder to ignore it.